Arrival in Bogotá, the capital city of Colombia. The day will start with a half day city tour to the famous historical centre of La Candelaria with its colonial houses, the Plaza Bolivar, the Cathedral, the Capitol and other historic buildings. Afterwards you will visit the famous Gold Museum of Bogotá and the underground Salt Cathedral of Zipaquirá. Today you will attend one of the greatest and most traditional coffee farms in the country. The Hacienda Coloma is located in Fusagasugá, just one and a half hour away from Bogotá. You will get insight of the coffee production, from the growing and roasting and the completion. 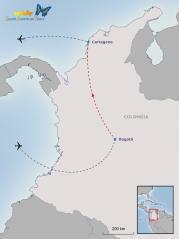 Flight to Cartagena, the most beautiful colonial city on the Caribbean coast. During a half day city tour you will steep into the history of Cartagena. Visit the Convent of La Popa, have a photo-stop at the Fort San Felipe and walk through the colourful streets and attend the convent of San Pedro Claver. Enjoy a full day tour to the Rosario Islands (2h boat-ride). The archipel of coral reefs and crystal clear water lies 45km south-west off shore Because of its underwater riches, the islands were declared a national park. Small beaches with crystal clear water give you the possibility to swim or snorkel. In the afternoon return to Cartagena. The day is at leisure for own activities. Discover the lovely historical centre on your own or enjoy the beaches around Cartagena. Transfer to the airport for your homebound flight or individual extension in Cartagena.